Hand-washing with soap protects health and saves lives. Hands are a natural breeding ground for germs, in fact they are one of the principal carriers of disease-causing germs. Nearly 80% of infections are spread by hand, so encouraging good hand hygiene behaviors is an effective way to stop germs spreading. 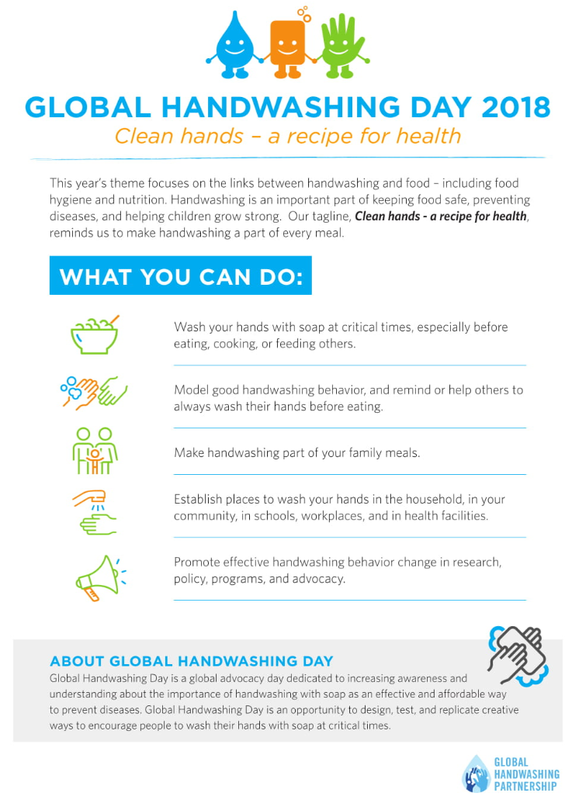 15 October - Global Hand-washing Day is a global advocacy day dedicated to increasing awareness and understanding about the importance of hand-washing with soap as an effective and affordable way to prevent diseases. Even though hand washing is part of our daily routine, we quite often don't get it right. Did you know that the CDC (Centers for Disease Control and Prevention) recommends that one should spend at least 20 seconds scrubbing his or her hands with soap?